Amy caught the football bug during last year’s World Championships in Brazil. I mean, how couldn’t she seeing that she’s half German and we actually ended up winning the tournament? 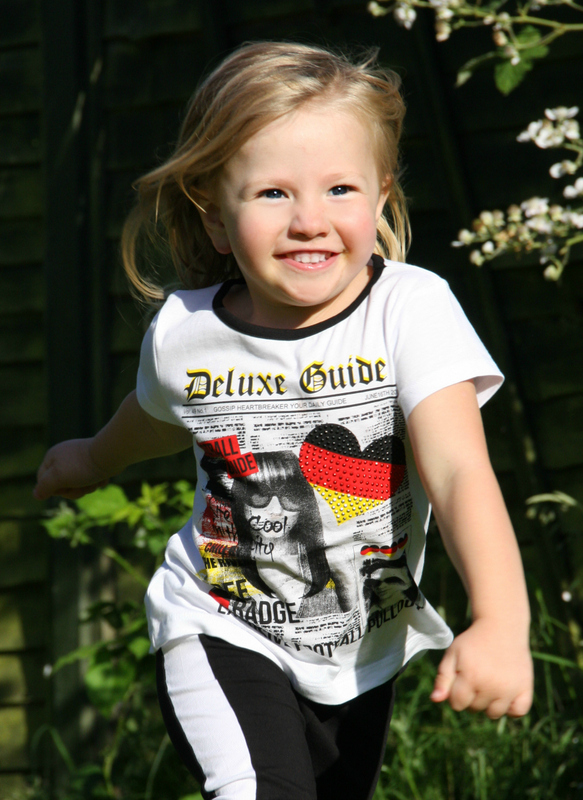 Anyway, when we moved to Germany, her interest in the sport grew immensely. My entire family are supporters of our local football club, F.C. 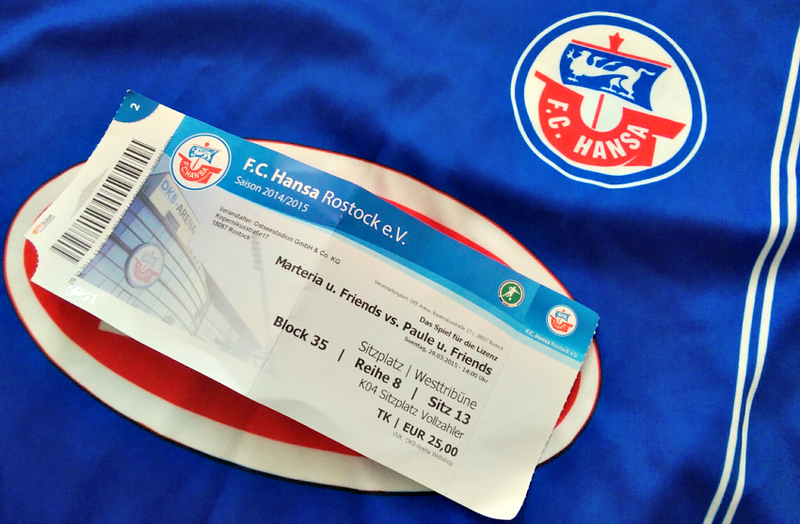 Hansa Rostock, so when club legend Paule Beinlich and rapper Marteria organised a charity game to save the club’s license, we just had get tickets for all of us and take Amy to her first football match. My dad was a little worried that it would be too loud for her in between 27,000 supporters and that she’d get bored, but she was absolutely fine and really enjoyed herself. Towards the end, she even stood on the chair, waving her scarf (of course, we kitted her out accordingly) and singing the club’s anthem “Hansa Forever”. She even ate her very first Bratwurst, which she has never liked before! It’s amazing what the atmosphere of a football stadium can do! 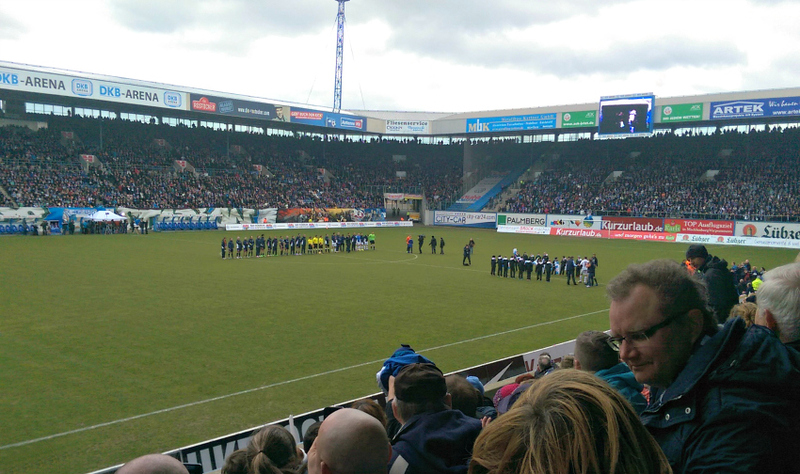 The match itself was fantastic. It was incredible to see former Hansa players such as Marko Rehmer, Oliver Neuville, Perry Bräutigam, Timo Lange or Magnus Arvidson play along celebrities such as Die Toten Hosen frontman Campino, Olmpic Gold medallist Andreas Dittmer or handball legend Stefan Kretschmar. The result? A 6:6 draw, which left the entire stadium hoping for a re-match next year. Organisers Marteria and Paule didn’t want to promise anything just yet, but if we’re lucky, we’re in for a challenge cup and we’ll definitely be on board again. 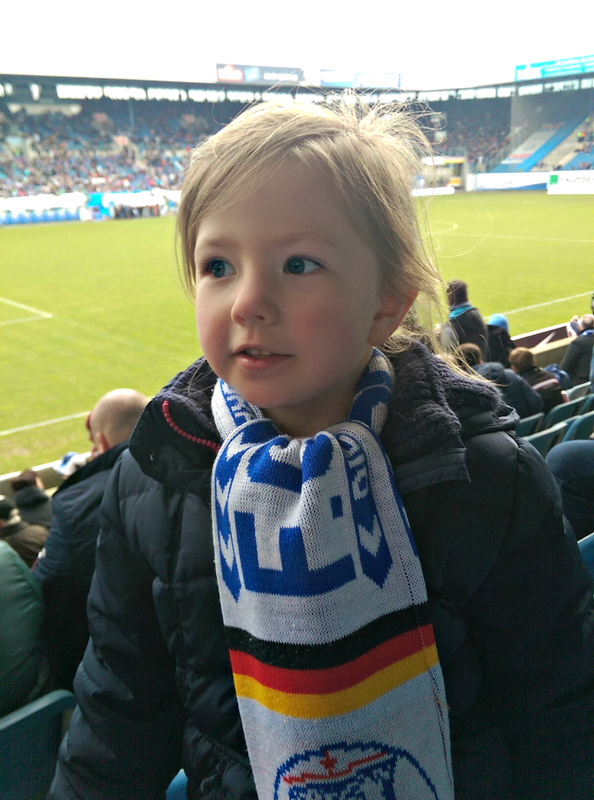 When did you take your kids to their very first football match and how did they like it? aww, sounds like she had a great time! My 3 were probably a similar age, although I think Sam might have gone when he was quite a bit younger – he went to his first baseball game at just a few months old, which probably explains a lot really!